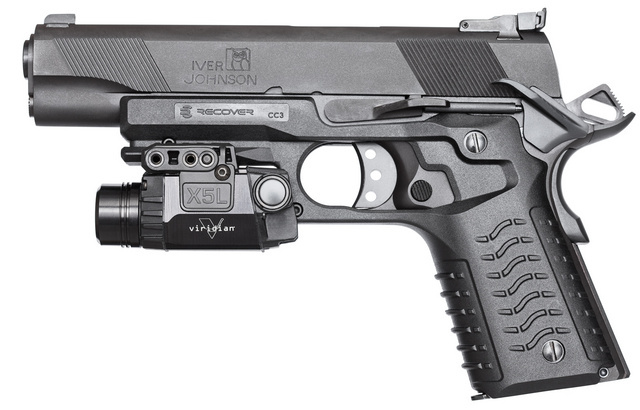 Iver Johnson 9mm Eagle M1911 with a Recover grip/accessory rail combination. The original 9mm is the bottom pistol. Changeover took about two minutes, the resulting grip is slightly thicker than the original and a little softer in the hand. This entry was posted in light/laser, pistol and tagged 9x19, M1911, Viridian. Bookmark the permalink. My initial gut reaction is, “um, NO.” It might work fine, but unless someone I knew raved about it, I’d be unlikely to pick it up to try it out. Concept is interesting, buuuut….. I might try one of those if I had a “slag” gun to throw it on. Not necessarily innovative but still interesting and contingent upon pricing a consideration for the toy box. Other more permanent options involving the use of a good gunsmith or advanced tinkerer are possible. Yet this Goldberg set ups just wacky enough to do the trick. Still do not understand why they resurrected that name… I even asked at the NRAAM, and no one in their booth had a good answer. That’s got TAPCO written all over it. 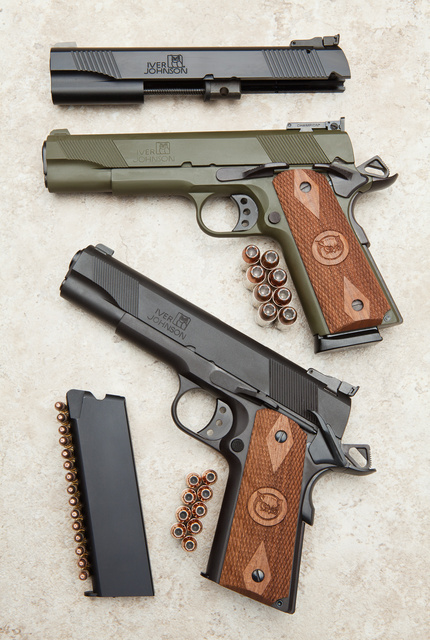 Wow, an Iver Johnson 1911? Mr. Oleg, you have such a flair for digging up the gold and that’s probably the best make of 1911 to showcase with a new frame technology. Such an obscure company with so many ties in U.S. firearms history.